The Calgary Roughnecks continued to roll on Friday night as they beat the Vancouver Stealth handily by a score of 20-12. The win gives them three in a row and pushes their record to 4-5. The Stealth drop to 1-9 on the season. Calgary leads the season series 2-0 with two more games to play at the Langley Events Centre. In a game that was never really close, the Roughnecks got a breakout performance from Holden Cattoni. In the absence of Dane Dobbie due to suspension, the second-year lefty seized the opportunity and led the team with five goals and six assists. In the second quarter alone, in a span of 4:27, Cattoni scored 3 times and assisted on another, all while coming off the bench in a very Dane Dobbie-like fashion. Once again, the Roughnecks transition game was stellar and proving to be one of the best in the league. Their steady play throughout the season has exploded recently and it’s in no small part to goaltender Christian Del Bianco. His athleticism and ability to move the ball quickly have given the Roughnecks a very unique weapon. Combined with Tyson Bell, Zach Currier and the rest of the Roughnecks back-end, the Calgary transition game consistently pushed the ball up-field and caused headaches for the Vancouver defence. Del Bianco finished the night with three assists. For Vancouver, there weren’t a lot of positives on this night. 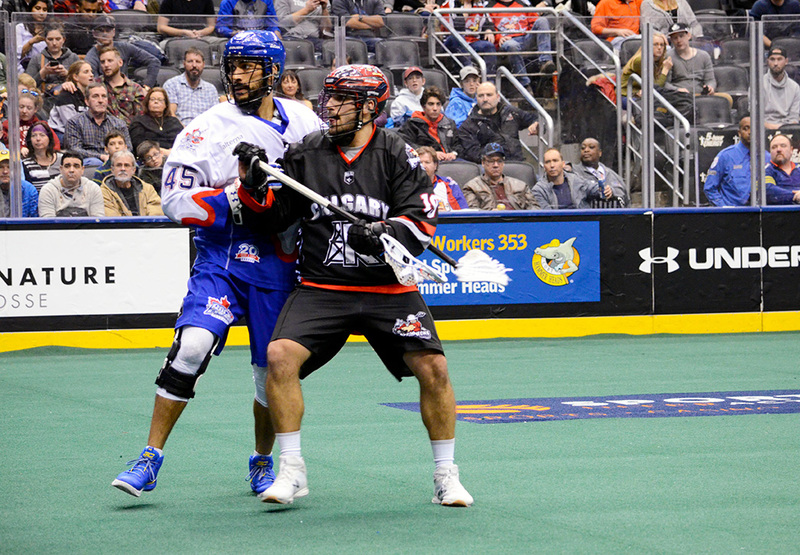 After scoring the first two goals of the game, the Stealth would go on to surrender 13 first half goals including a nine-goal run by the Roughnecks. Despite a goalie change and a timeout, the Stealth were unable to generate any first-half momentum and went to the locker room with the score 13-4. All night, the Stealth appeared plagued by defensive breakdowns as well as an inability to deal with the Roughnecks transition game. Despite a four-goal run to start the third quarter, the Stealth just couldn’t find a way to overcome their poor first half. The Stealth were led by Rhys Duch (1G, 7A), Logan Schuss (5A), Corey Small (4G), and Tony Malcom (3G, 1A). Holden Cattoni was the top offensive performer for the Riggers with an 11-point night. Curtis Dickson scored some timely goals in the first and third quarter to kill off any Vancouver momentum and finished with four goals and three assists. Rookie Tyler Pace had three goals and two assists, while Wes Berg finished the night with three goals and four assists (including a wicked BTB goal with 2:04 left in the first quarter). On a night of great offensive performances, it may have been easy to overlook the contributions of Tyson Bell. Bell used his athletic ability time and time again to affect the game positively for his club. Bell scooped 11 loose balls, assisted on two goals and was a force on defence, highlighted by his hit on Ryan Fournier as he tried to circle the net. Next week, Vancouver will host New England, while Calgary travels to Saskatoon to take on the Rush.